St James sits out on a limb, away from the other Saints. 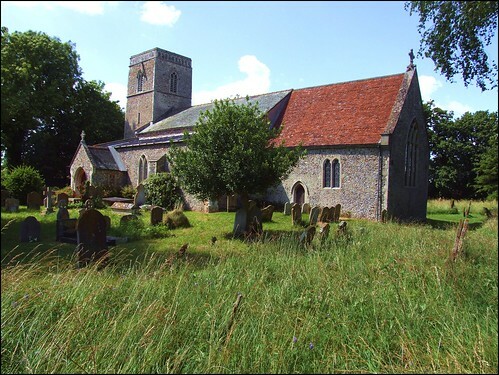 It is the highest village in East Suffolk. In the early days of my journey around the county I once came here on a bleak winter's day, cycling in one of those High Visibility garments which Health & Safety legislation had popularised. I must confess that I generally don't wear one nowadays, prefering to take my chances, but in those days I wore it so often that I forgot I had it on. Arriving at St James, I was slightly peeved to find the church locked, but the man at the cottage next door directed me to the churchwarden across the road. I knocked on the door, and asked for the key. "Why, what on earth's the matter?" the good lady cried anxiously. It took me a moment to realise that her concern arose because of my bright yellow jacket, and so I hastened to assure her that I was not from the emergency services. With something like relief she gave me the key. Today, such an exchange is unnecessary, because like all the churches in this friendly benefice St James is open to visitors every day. The graveyard is small and pleasingly full of headstones. It provides the setting for a late 13th century tower, and some 13th century features in the otherwise Decorated style walls, may well indicate the true date of the building as it is now. However, there is a surprise inside, as we will see. You step into a space which is clearly much loved and cared for. It speaks of a busier life than this sparse, remote village would suggest. The Victorian restoration was at the hands of Diocesan architect Richard Phipson, so it was a bit heavy handed. More recently, the church has been beautified by its enthusiastic parish. Local people in the 1920s and 1930s carved reliefs which are set in the chancel wall. I believe that the Rector himself was responsible for the two massive owls which guard the lectern. The whole thing is unusual and amusing, and there is no church quite like this one for carvings. The two brasses which Mortlock found on the wall have been reset in their indents on the floor. This is good news, because if (heaven forfend) there is a fire, brasses set in the floor do not melt - the heat rises away from them. Brasses on the walls, however, quickly become runny yellow rivers. Turning to face the west, there is the surprise of what appear to be two Saxon round windows either side of the royal arms. If that is really what they are, then this would suggest that the west wall is that of a pre-Conquest church, and when the tower was built against it they simply punched the tower arch through. In front of it, the Norman font sits on a bold pedestal, and is crowned by an extraordinary font cover which is probably 15th century. It is as idiosyncratic as the rest of the woodwork in the building. More medieval woodwork stands at the west end of the south aisle, whenre what was probably the medieval rood screen now cordons off a vestry. But the real treasure of this church is the medieval relief of St James in the chancel, above the priest door. I'm not sure of its origins; I was told that it had been given to the church in the 19th century by the vicar of neighbouring Rumburgh, but I don't know where he got it from. It may even have come from this church originally. Back in 1999, I had chatted to the churchwarden, and asked her what it was like to be in such a huge benefice (there are 11 parishes). She made it clear, as other churchwardens had, that the benefice system had been the salvation of tiny churches like this, which might otherwise have ended in redundancy. However, she added, there were so many churches in the benefice that, for the first time, St James hadn't had a Christmas service at all the previous year. It was only as I cycled off that I realised she meant the first time for centuries.